:This biblical interpretation textbook provides an accessible introduction to the latest approaches in evangelical hermeneutics. Having many years' experience teaching hermeneutics to undergraduates, Robbie Castleman explains complex themes in an engaging way. She addresses all the current schools of thought in contemporary evangelical hermeneutics and incorporates recent important trends in biblical interpretation. This book helps students recognize the living Word as they read and study Scripture as an act of being engaged by the triune God of grace who breathed and still breathes "the word of the Lord." 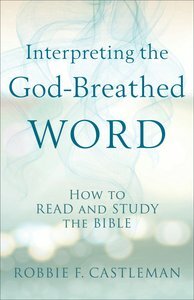 About "Interpreting the God-Breathed Word: How to Read and Study the Bible"
Robbie F. Castleman (D.Min., University of Dubuque) is associate professor of biblical studies and theology at John Brown University in Siloam Springs, Arkansas. She previously served for several years as a staff member with InterVarsity Christian Fellowship, specializing in ministry to graduate students at campuses in and around Tallahassee, Florida. She is the author of the Fisherman Bible Guides; Miracles, Elijah, David and King David (Shaw/Waterbrook) and the IVP Connect LifeGuide Bible Study Peter and The Story of Scripture: The Unfolding Drama of the Bible, and she is a contributor to the book For All the Saints (Knox/Westminster). 2. Seeing Scripture: what Does The Text Say And How Does It Say It?